So I got back from Hwacheon last Tuesday, had a few days to rest, and then was off again for the bi-annual Fulbright conference on Friday. This is a big conference that Fulbright does every semester – every single Fulbright teacher in the country, plus the entire Fulbright staff, all congregate in one place to swap teaching and traveling tips. Because Gyeongju was the capital of the ancient Silla dynasty for the entire 1000+ years of the dynasty, the fall conference is always held in Gyeongju. Gyeongju is kind of a big deal :). Which was nice for me, because I didn’t have to travel anywhere – while other people were coming in from buses, trains, and even planes, all I had to do was hop on a bus for 10 minutes and I was there. Friday night was pretty awesome. I had been soooo excited to see everyone – most of them I hadn’t seen or even spoke with at all since departure day 2 months earlier. So we all had a big reunion, started the conference workshops, and overall had a splendid time – I did, at least. In addition to that, there was another open mic night on Friday in downtown Gyeongju. I had signed up to recite a poem – IF, by Rudyard Kipling, a poem about what it takes to be a man – one of my all-time favorites. I was planning on going by myself after the workshops finished for the night. However, because everyone else was in a strange city with a free evening, I became the resident expert, and about ten other Fulbrighters ended up coming to the open mic with me. It was alot of fun – I was nervous about reciting (I had never done anything like that before), but being there with my dear friends made it all worth it. Saturday, though, was not quite as awesome. I woke up with my voice sounding like a scratched up record. I felt fine – didn’t have a sniffle, a sneeze, or even the smallest trace of a sore throat – but my voice sounded awful. By Sunday morning it was completely gone. I could not utter a sound above a whisper. And, in the midst of an excited reunion over 100 people strong, that basically meant that I could not say anything, period. No one could hear me when I tried, anyway. Somehow I kept ending up next to another Fulrbighter who is partially deaf and mostly blind. My inability to speak loudly and his inability to read my lips left us completely unable to communicate anything, try as hard as we might. It felt like salt was bring rubbed in my wound, just adding insult to injury. All day on Sunday throughout the cultural tour around Gyeongju, I felt more and more invisible. It was even worse because this weekend was supposed to be my respite. I had soooo been looking forward to having a weekend to just relax and not worry about the stresses of my homestay – the weekend was finally here, and I was forced to sit on the sidelines, unable to participate in any of the conversations. By Sunday afternoon I couldn’t take it anymore. I slipped away from the tour (it was optional, anyway), and had a picnic with some second-year teachers who had also opted to not go on the tour, since they had gone last year. I still felt mostly invisible, but in the smaller group I was able to get some points across if I really tried. This random old Korean lady who decided to give us a tour. It was awesome. Sunday night there was a goodbye dinner. There was a wonderful meal, a beautiful venue, and sparkling conversation – and I was still mute. It was unbearable. I never realized how important it is to me to be heard until I wasn’t anymore. I slipped away early and just started wandering. I heard music somewhere in the city, and followed my ears (at least those still worked!) until I found a traditional dance performance of some kind. I sat in the back and watched for a while. Then I happened to glance over to my left, and lo and behold, there was Adam, my friend from Hwacheon! He had gotten restless too, apparently. He came over and asked if I was ok – I wasn’t, not at all – and so he suggested that we go on a walk. Gyeongju at night….it’s pretty at any time of day! There in the still night, with no huge crowd to drown out my whispers, was the first time I had been heard all weekend. And I just let it out. Adam’s a good listener, and if felt so good to release all of my frustrations that had been pent up over the course of the weekend. When we came back I went to an informal Bible study that the Christians in the group had quickly organized by word of mouth. I was so grateful to have my friends there around me, particularly Dianna, the teacher who was at my school last year. She had come to Gyeongju early to visit, and we had spent the day together on Thursday. I told her all of my frustrations with my homestay, my excitement about the upcoming conference, yada yada yada. Well, at the Bible study she was able to relay those sentiments to the group so that they could pray for me. My inability to do so myself frustrated me to no end, but I was so grateful that I had shared with her while I was able to, and that she was willing to be my voice when I had none. Tuesday I woke up still voiceless, and with a migraine to boot. Needless to say, that was a longggg day. Although I must say, if I HAD to have a migraine, that was a good day to have it – since I also had no voice, I didn’t really teach, just showed a movie in class. 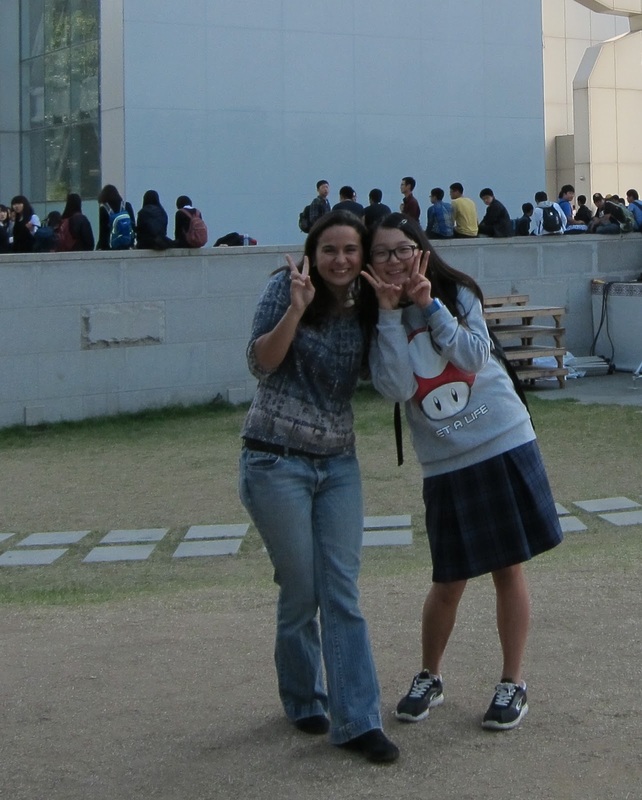 It’s killing me, though, because I really WANT to teach – I love it, it’s the whole reason I came to Korea in the first place! And all of my students want to say hello and talk to me, and I can’t say anything to them! It’s really quite depressing. My co-teachers actually sent me home early today, telling me to rest. Super sweet of them, but I don’t think they realized how very much I WANTED to be there. Oh well, such is Korea – always trying to help :). Anyway, that’s my life right now. Voiceless and banished from school. I’m sorry this wasn’t a happier post. I’m one sad puppy right now :(.